If you have considered Solar Power at your home or businesses, your first step should be to get an Evaluation of installation costs, product costs, and all your potential savings. This will give you a good idea of all the potential options you have when installing your Photovoltaic Panels and answer any questions you may have. Santa Clarita Solar Installation is a certified Solar Contractor and can give you an accurate and detailed assessment of Solar Installation on your property. We asses various ingredients that will determine the best size of your Solar Panel System, along with what capacities your system will be able to hold. We want you to have the ability to make informed decisions about starting the savings with your Residential or Business Solar Energy Production. Our Estimates are always Free of Charge and come with No Obligation. 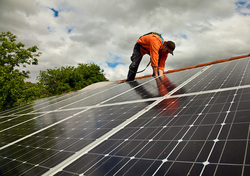 California residents can't afford not to get a Solar Estimate Free of Charge. Call us today or fill out the simple form on the right of the page. We would love to hear from you and answer any calls you may have.